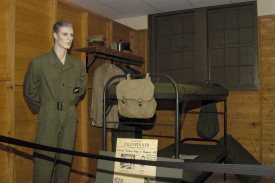 The History and Traditions Museum at Lackland Air Force Base offers a panoramic history of Air Force Basic Military Training, starting with pre-World War I through Operation Iraqi Freedom. The museum contains a variety of displays covering the evolution of aviation, including a unique structural fuselage of the ancient JN-4 "Jenny" aircraft. Different uniforms worn throughout Air Force history are also on display. The museum is open Monday through Friday from 9 a.m. to 4 p.m. and is located at the intersection of George Avenue and Nellis Street. Admission to museum complex is free. Inside the museum you find a diversity of history preserved and presented in an educational environment. You will not want to miss visiting this museum during your stay in the Lackland Air Force Base Area. The San Antonio Riverwalk is a public park consisting network of walkways along the banks of the San Antonio River lined with business, restaurants, attractions, and hotels. On Saturdays, city bus service is available from the Reception Center to the United Services Organization (USO), one block from the Riverwalk in downtown San Antonio. Roundtrip service starts at 9:20 a.m. and runs in 20minute intervals. The last bus leaves the USO at 6:40 p.m. Fare is $2.50 per person, each way, exact change only. Children ride at a reduced or free fare. 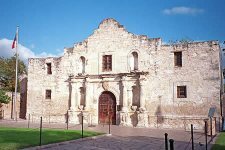 Be sure to tour The Alamo while in San Antonio. The old mission is where a small band of Texans held out for thirteen days against the Centralist army of General Antonio López de Santa Anna. The memories of James Bowie, David Crockett, and William B. Travis are as powerful today as when the Texan Army under Sam Houston shouted "Remember the Alamo!" as it routed Santa Anna at the battle of San Jacinto on April 21, 1836. The Alamo is open every day of the year except Christmas Eve and Christmas Day. Hours are 9:00 A.M. to 5:30 P.M. Monday through Saturday and 10:00 A.M. to 5:30 P.M. on Sunday. To better serve visitors, the Alamo will remain open on Fridays and Saturdays until 7 P.M. during the months of June, July and August. Admission is free. SeaWorld takes you on a one-of-a-kind journey to the wonders that exist beyond the oceans door. Just minutes from Lackland AFB it is a place you and your airman will be sure to enjoy. From the incredible performance by Shamu to the thrilling roller coasters there is something for everyone. During 2014, free admission for your airmen and 3 of their direct dependents is available from www.wavesofhonor.com. The 2014 operating season of SeaWorld is from February 2 through December 31, 2014. A complete list of attractions for the city maybe viewed at the "Visit San Antonio" website.